Fish not only incorporate variety into your diet, but they also benefit your heart. The Harvard School of Public Health notes that eating 6 ounces of fatty fish each week lowers your heart disease risk by more than one-third. Canned tuna and sardines both boost your fish intake and offer several nutritional advantages, including protein and healthy fat. The nutritional profiles of tuna and sardines differ slightly, however, and they offer slightly different amounts of vitamins and minerals. Reach for either canned tuna or sardines and you'll increase your protein intake. A 6-ounce portion of canned sardines, packed in oil, provides 41 grams of protein, while an equivalent portion of canned tuna provides 49 grams. Your body can use this protein to fight infection and maintain lean muscle tissue. Sardines and tuna also both contain omega-3 fatty acids, which support brain function and combat cardiovascular disease. A 6-ounce portion of sardines provides 2.4 grams of omega-3 fatty acids, and tuna offers 1.5 grams per serving. 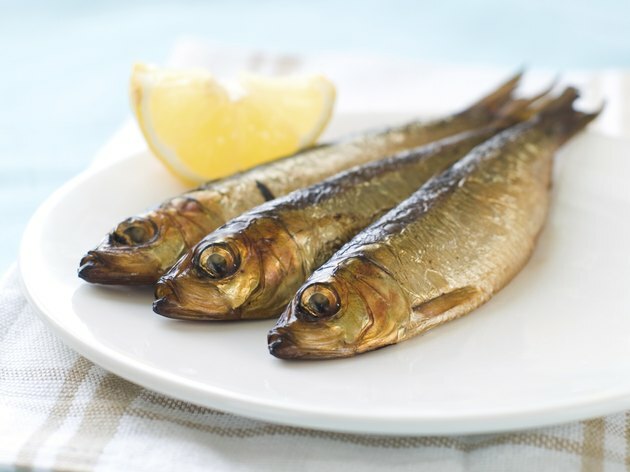 Sardines offer more vitamin E per serving than tuna, and they also contain more calcium. Vitamin E plays a role in healthy blood circulation by promoting new red blood cell development, and its antioxidant function combats tissue damage. Calcium promotes healthy communication between your cells, helps your nerves function and contributes to strong bone tissue. Eat 6 ounces of sardines and you'll boost your vitamin E intake by 3.5 milligrams -- 23 percent of the recommended daily intake -- while an equivalent portion of canned tuna contains 1.5 milligrams. Each serving of sardines also increases your calcium intake by 649 milligrams, or 65 percent of your daily calcium needs, compared to 22 milligrams in a serving of tuna. Reach for tuna over sardines as a superior source of vitamin K. You need vitamin K for protein activation, and it activates proteins needed for blood clot formation, bone development and cartilage health. A serving of canned tuna offers 74.8 micrograms of vitamin K, which is 60 percent of the recommended daily intake for men and 83 percent for women. An equivalent serving of sardines, in contrast, provides just 4.4 micrograms of vitamin K.
Whether you opt for tuna or sardines, you'll significantly increase your intake of sodium, although sardines contain more sodium per serving. Eating 6 ounces of canned sardines increases your sodium intake by 859 milligrams, which makes up 37 percent of your 2,300-milligram upper daily limit. An equivalent portion of canned tuna contains 602 milligrams, or 26 percent of your limit. High-sodium foods strain your kidneys because they have to work harder to remove the excess sodium from your system, and high sodium consumption also increases your risk of cardiovascular disease. Is Ahi Tuna Good for You?